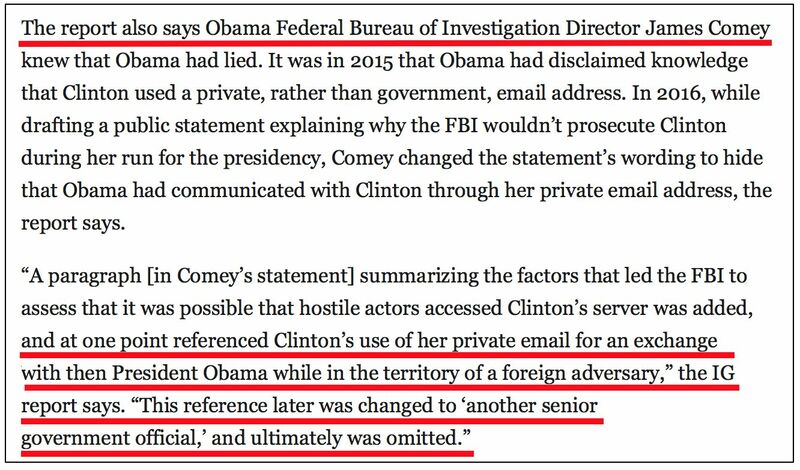 Thursday's Inspector General's report reviewing FBI and Department of Justice actions before the 2016 election effectively concluded that former President Barack Obama lied to the American people and committed illegal acts in emailing then-Secretary of State Hillary Clinton's private-server email addresses. 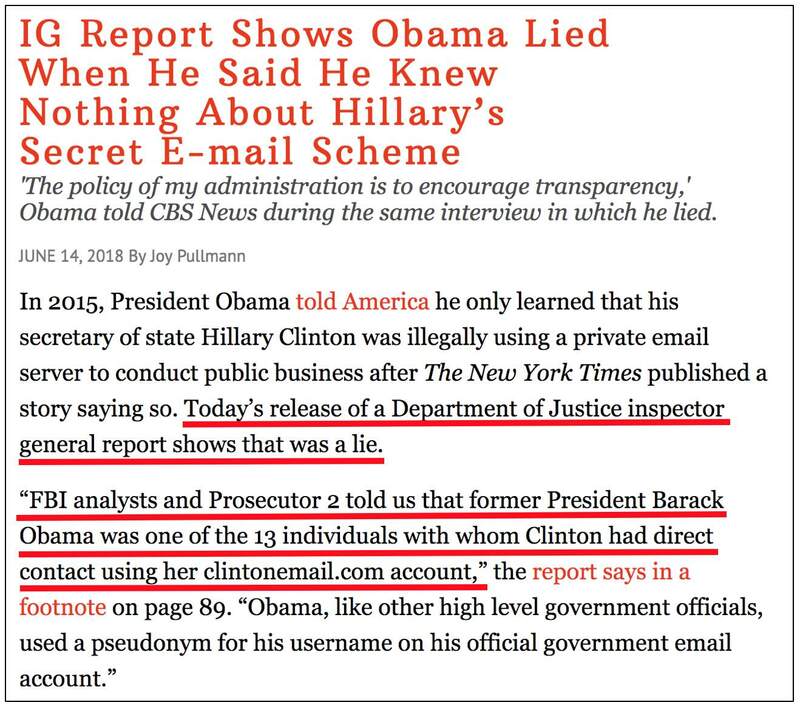 The IG also found that former FBI Director James Comey scrubbed all hints of Obama's prior knowledge from his July 2016 statement explaining why Mrs. Clinton would not be indicted for her illegal acts. Despite these indisputable facts, reports at the nation's three gatekeeping establishment press outlets have not mentioned Obama's name in connection with any of this. BILL PLANTE: Mr. President, when did you first learn that Hillary Clinton used an email system outside the U.S. government for official business while she was Secretary of State? OBAMA: Let me just say that Hillary Clinton is and has been an outstanding public servant. She was a great Secretary of State for me. The policy of my administration is to encourage transparency, and that's why my emails, the BlackBerry that I carry around, all those records are available and archived. And I'm glad that Hillary has instructed that those emails that had to do with official business need to be disclosed. AP — Searches on Obama's first and last name (not in quotes) and then only on Obama's last name returned nothing relevant. Washington Post — In four items found (here, here, here, and here), Obama's name only came up in one sentence in the third item about Trump Attorney General Jeff Sessions' reaction to the IG's report. A search (not in quotes) on "Obama FBI" returned one additional item about Peter Strzok's utterly not credible response to a question about Obama's wanting to "know everything we are doing." New York Times — A search (not in quotes) on "Obama F.B.I" (the Times uses periods with acronyms) returned four items mentioning Obama's name in IG report-related matters. None of them mentioned the lie and illegal acts Pullman described. The idea that actions such as these committed by a Republican or conservative president would be so completely ignored by the press is obviously absurd.